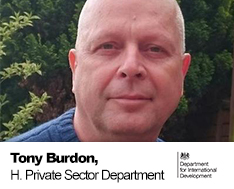 Tony Burdon joined DFID in 2005, and became Head of DFID’s Private Sector Department in 2015. The department leads on mobilising investment and working with business, and manages the shareholder relationship with CDC, the UK’s Development Finance Institution. While in DFID, Tony has led DFID’s Growth and Resilience Department – focused on building the enabling environment for economic development; was head of DFID’s economic team in Nigeria, was Deputy Head of DFID Nepal, and speechwriter to the Secretary of State, Hilary Benn. Before DFID, Tony worked in the UK Treasury from 2001 on international development, tax policy, and was seconded into the Commission for Africa where he led on trade policy. Prior to the civil service, Tony worked for Oxfam – in policy, country and regional leadership positions, and humanitarian delivery, and was on the board of the Jubilee 2000 debt campaign. Over 15 years of his career has been spent living and working in developing countries – Malawi, Sudan, Uganda, Angola, Nigeria, Iraq and Nepal. Tony has degrees in Development Studies, Economics and Civil Engineering from the Universities of Bath, Birkbeck and Manchester.